Image Size: 36"w x 18"h.
There’s more than one way to bring down an opposing fighter, as 1st Lt. Don Lopez learned on December 12, 1943. He and his comrades of the 75th Fighter Squadron were at 6,000 feet over South Central China when the young airman experienced his first scramble. Lopez ripped his P-40 into the middle of a flight of Japanese “Oscars” and quickly engaged one of them, flying directly at one another, firing steady hits. Lopez expected his opponent to break off, but neither did so. Head-on only a few feet apart, the Oscar swerved right . . . too late. Lopez lost three feet off the end of his wing, but the Japanese pilot lost substantially more, including control of his aircraft, which plunged toward the earth. Undaunted, Lopez pressed the attack again and scored enough victories to join the ranks of “ace” fighter pilot. 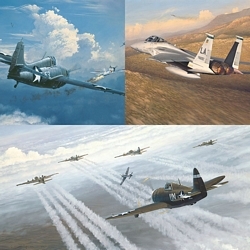 Artist Bill Phillips’ careful research and sure technique present a stunning portrait of a classic warbird . . . while Don Lopez provides the true-to-life drama for an exciting limited edition canvas.